The block for March was a a big, 14-inch square (finished size) Star Chain block, made from green with the quilters choice for two other fabrics, one light and one with high contrast. 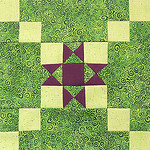 Forty quilters made 102 Star Chain blocks, which were won by 6 quilters (each receiving 17 blocks). This post serves as an archive of blocks made and won.